Renaissance Costumes that Help You Keep in Character and Keep Warm: Part 2! Stretch Velour Pants: For days, nights, or events when a skirt or dress simply won’t work, I turn to my trusty black velour pants. Well-suited to a pirate costume, these can also be worn beneath almost any dress or skirt for added warmth. Chess Queen Bodice: Remember those layers I mentioned in Part 1 of this post series? This lovely piece is among my most popular choices! Fashioned from faux suede with a soft satin lining, it pairs well with many tops and dresses. It also looks pretty fierce with the velour pants above, and if the Renaissance was anything, it was fierce! 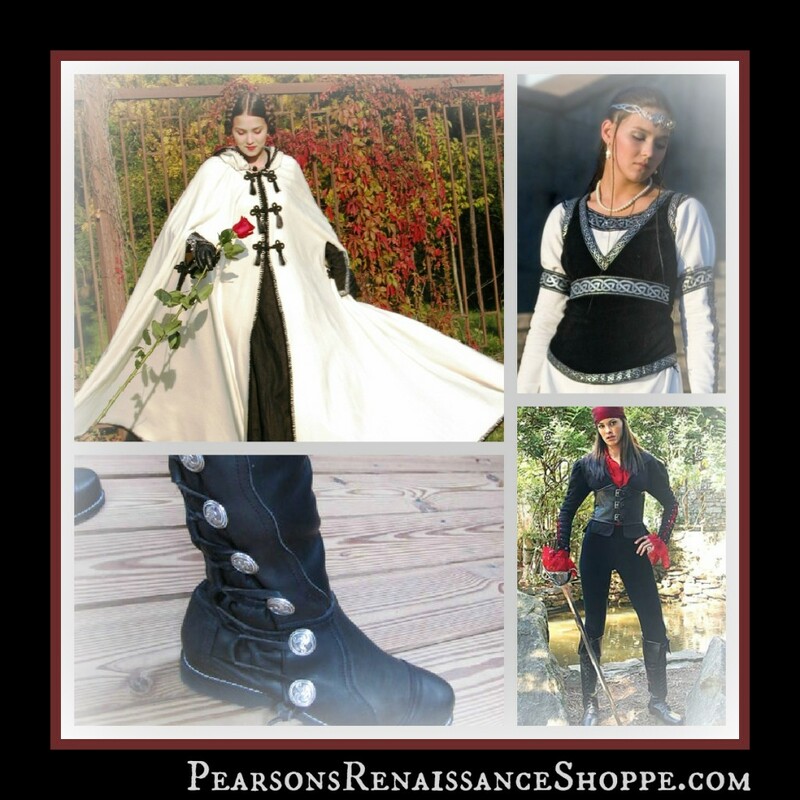 Queen Isabella Renaissance Boots: The versatility of these boots knows no bounds. And – you get to customize them! They are definitely an investment piece, with a heavy leather upper and screw-on buttons that you can switch up as you wish, but you’ll understand their price the first time you see them in person. They are warm, comfortable, and built to last, with a Vibram welted sole and heel. Their quality is unlike any we’ve seen, and as they can be re-soled, we expect you’ll enjoy them for many years. I personally love the brown boot with blue trim, but have yet to see a customer order a color combo that didn’t turn out awesome!